End 2012 the Dubrovnik Prijeko Palace asked me to create a small art piece using a nail collected from the building during the restoration . After approval I produced my design, a ceramic sculpture, in an edition of 200. It’s available at the palace packed together with a nice booklet in a luxury gift box. One of the discoveries during the renovation of the building was a large number of ancient, handmade nails in the oak boards and beams; true masterpieces of handcraft. 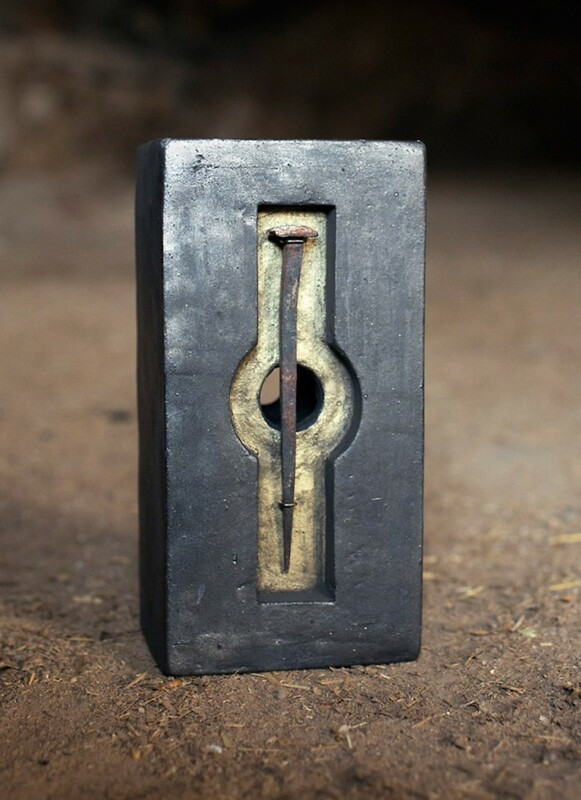 The nails inspired the Dutch artist Mark Verdoes (The Hague, 1960) in such a way that he took them to his studio in India – where people still use 1000 year old techniques in daily life – and used them as the basis for small art pieces. The keywords for his inspiration were nail, hole, room, space, building and key lock. The art pieces are made from Indian clay using traditional craftsmen techniques. The clay is carefully sieved, mixed with water and kneaded into model. After drying the pieces are baked in a traditional wood fired field oven made from earth. The result is sanded and treated with natural pigments. Gold pigments surround the nail and provide a warm and rich appearance. The nails start their second life; their value remains.Mark Verdoes developed many original techniques to create his art. Much of his new work is based on mud, reflecting his strong preference for natural materials. Sometimes old objects find a next life in Verdoes’ art.